Researching the Roumanian stitch was very interesting but also confusing: This stitch has a number of aliases—Roman, Romanian, Rumanian (probably a typo), Roumanian couching, Roumanian filling, Bokhara couching, Chinese cross-stitch, oriental, laid oriental, oriental couching, figure couching, antique couching, upright cross-stitch variation, overlaid, couched satin, Janina, Indian filling, New England laid, and this may not be all of them! Be cautious; sometimes these appellations may refer to an entirely different stitch or even one in a different needlework technique (examples: the Roman stitch in knitting and the oriental in needlepoint). I suspect the basic reason for these many names is because this stitch is such a delightfully simple, logical, quick-and-easy stitch to learn and also because of its variations and spacing configurations. Also, it undoubtedly developed independently in a number of locations. The Roumanian stitch is found on European, Near East, and Indian subcontinent embroideries. The name Roman stitch most likely came from the Rom (gypsies) who are believed to have migrated from India through the Near East to Eastern Europe and west. During the seventeenth century in England, it was popular on spot motif and band samplers, filling the large interiors of petals and leaves with the couching stitches forming the mid-veins, wide scrolls, and other large motifs. This stitch also decorated Eastern European household textiles and clothing. During the latter half of the eighteenth century in America, crewel embroiderers mainly used the Roumanian and three other stitches on their large bed coverings and curtains; the stitch was popular again on embroideries of the Victorian era. The Roumanian stitch (my personal preference because it’s the name most often referred to in modern needlework reference books) is composed of a single, long stitch that is secured at its mid-point by a smaller couching stitch. This flat stitch is traditionally worked from left to right for the long stitch and then returning right to left for the couching portion of the stitch (Figures 1 and 2); the overall stitching pattern is from top to bottom. The piece being embroidered may need to be turned to more easily accomplish this. The long stitch may be vertical (Figures 2 and 6), horizontal (Figures 1, 4, and 5), or diagonal (Figure 3). The couching stitch may be perpendicular (Figures 1, 2, and 6) or diagonal (Figures 3, 4, and 5) to the long stitch and can be pulled taut or left somewhat loose so that it is nearly indistinguishable from the long stitch. The Roumanian stitch is usually twice as long as wide (Figures 1 and 2), but this can vary greatly (Figures 3, 4, 5, 6, and 7). The couching stitch is always shorter than the long stitch. This stitch was probably created as a simple solution to a long and undoubtedly loose satin stitch by couching it down at its center with an additional short stitch to make it more stable and less likely to be snagged. If the couching stitch is perpendicular to the long stitch, then it’s often referred to as a Roman, oriental, or antique stitch. However, if the couching stitch is diagonal to the long stitch, then it’s more frequently called a Roumanian (Rumanian) or Bokhara couching stitch. If the straight stitch is extremely long, then more than one couching stitch can be used for each long stitch, and this variation then gives rise to an entirely new set of names—Chinese cross-stitch or Roumanian filling stitch. 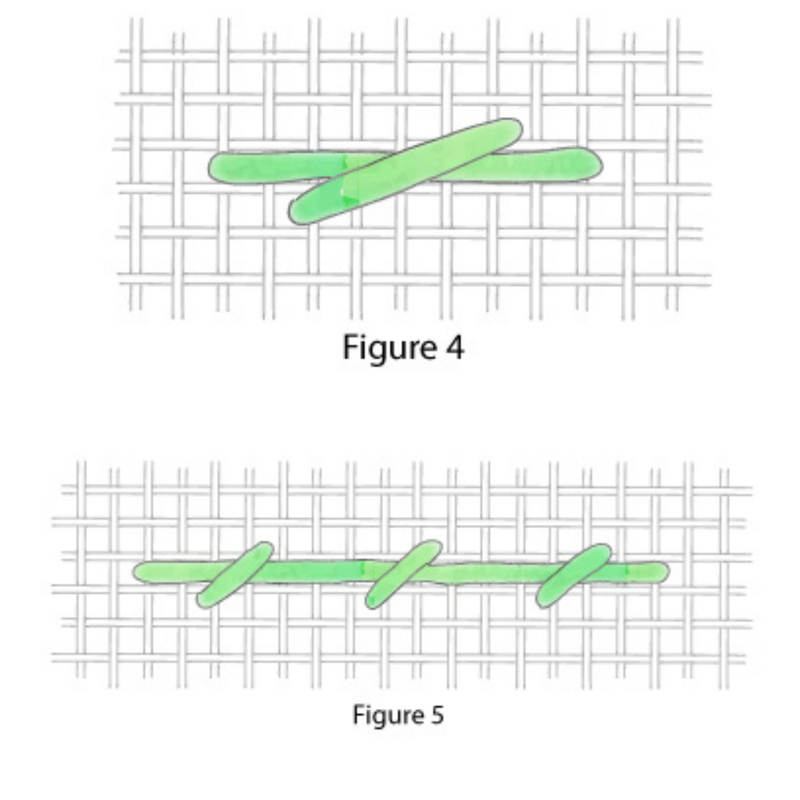 And to add to complications, a Roman or Roumanian filling stitch can also refer to a grouping of Roman stitches arranged in a specific pattern (Figure 6). To take this discussion one step further, one can argue that the queen, or rococo, stitch is just another variation of the Roumanian but with two sets of opposing long stitches whose ends share holes and are angled because of the placement of the couching stitches (Figure 8). 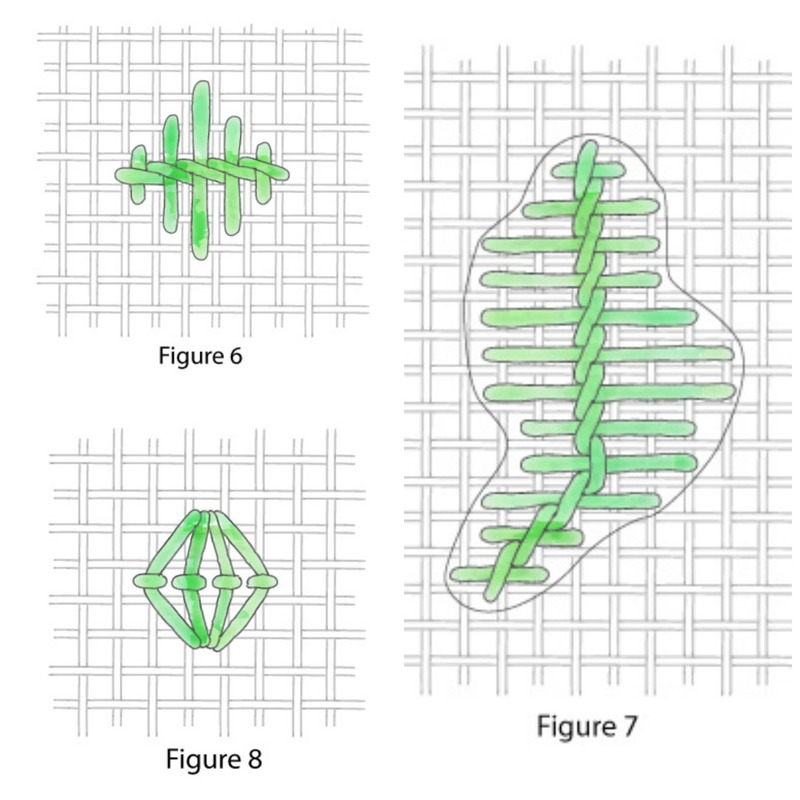 The versatile Roumanian stitch, and all of its many names and variations, is most often a densely worked stitch, forming a solid wide row, border, specific design motif (Figure 6), filling within a designated area (Figure 7), or even as an entire background. Any reasonable fabric and thread can be used as long as a needle can easily penetrate the chosen fabric (plain- or evenweave) and the thread is strong enough to withstand the stitching process. The fabric should be under tension (embroidery hoop, scroll frame, or wooden frame) to keep the long stitches taut and straight. Typically, a single thread color is used for both the long and couching stitches, stitching the long stitch first and then its couching stitch before proceeding on to the next long stitch. However, there is no reason why two colors can’t be used; thread up two needles and work in the same stitch procedure: long stitch, couching stitch, long stitch, couching stitch, and so on. Try this easy stitch. You’ll like it! Deanna Hall West is PieceWork’s needlework technical editor; previously, she was the editor of The Needleworker magazine. 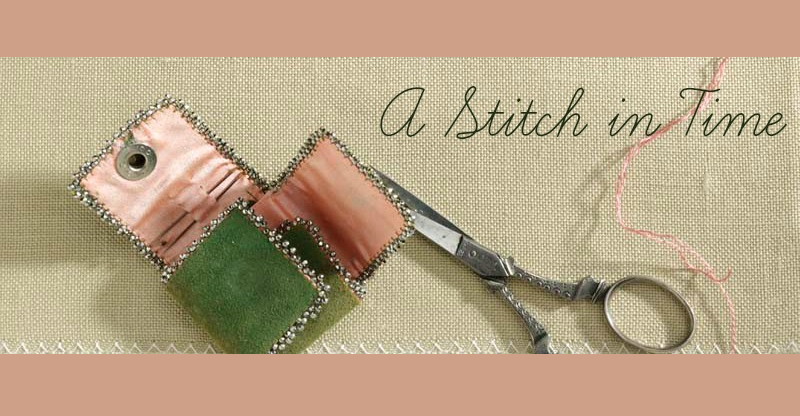 We are thrilled to welcome Deanna Hall West and her “A Stitch in Time” blog posts back. Read the entire “Stitch in Time” series! Enjoy! Featured Image: Scissors and needle case courtesy of Loene McIntyre. Photo by Joe Coca. Illustrations by Ann Swanson. Indulge your passion for needlework with PieceWork!